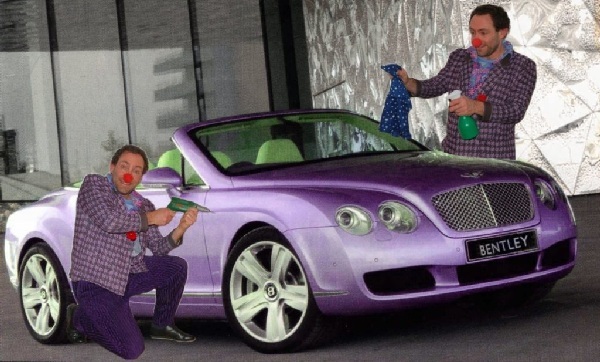 Clown Tom Bolton can be booked for open-houses, new model presentations or any special occasion at car dealers. Performance artist Tom Bolton has lots of experience entertaining for car sellers. Combining short shows with theme relevant improvisation, he amuses the adults and especially keeps the kids entertained. This helps sales personnel to better do their job in a positive atmosphere. Every situation is used to entertain; like cleaning, inspecting, measuring or fixing the cars. 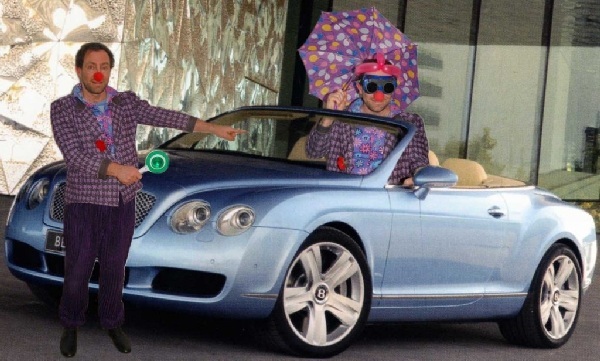 The clown driver uses racing goggles to demonstrate the convertible and his handy umbrella not only keeps the rain off but doubles as an emergency brake! Tom keeps the laughter flowing with his easy-going situation-comedy so your event can be fun yet productive. Especially for the kids he can also do balloon-twisting; making a racing helmet, car or any number of animals. Events like open houses at car dealers are different than festivals. There is usually a flow of participants but usually not a lot of people at one time. The goal is not to have the clown be the star with a bombastic show. More sensible is to pace the entertainment out over the day, entertaining in the background without always being the center of attention. Having the world’s best clown but not selling cars is not the aim. Rather, it’s creating a good atmosphere so nobody, especially the kids, gets bored. This allows the sales people to optimize their presentations. Happy customers, satisfied car dealers, contented clown; what more could one want?